All aboard! 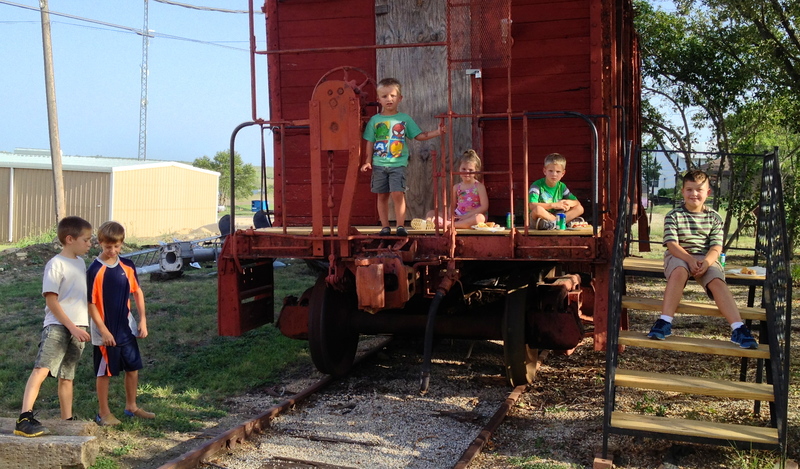 Kids love the caboose . . . even big kids. Sorry David, you gotta wait your turn! 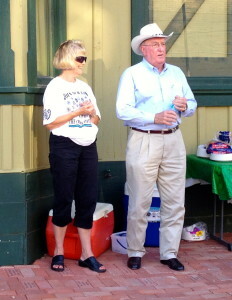 There was good turnout on Tuesday, August 5 outside the Coupland Depot Museum for National Night Out. There were a lot of new residents and plenty of kids, including a darling set of double twins. Deputy Matt Kriedel addressed the crowd. He shared information about recent burglaries in the area. He especially stressed that vehicle burglaries did not require forced entry and recommended that folks remove valuables from their vehicles and keep them locked. He also said that some meth labs are still in the area and mentioned the “Burrito Bandit,” who was eating a burrito stolen from the victim’s refrigerator when he was discovered by the resident. Kriedel warned about various scams such as people calling and claiming to be a relative who needs emergency financial help in the form of a pre-paid credit card. Another elderly resident was scammed out of $2,000 by a couple of ne’er-do-wells for “repair” to the supposedly damaged lightning rods on her home. The check was stopped before it could be cashed so she was lucky. Chili-dogs, chips, cookies, and cold drinks kept every from feeling the heat too much. A nice southerly breeze and the shade of the Depot did the rest. The Depot Musuem was open for anyone who wanted to check it out. This entry was posted in Crime Reports, Social, What's New? 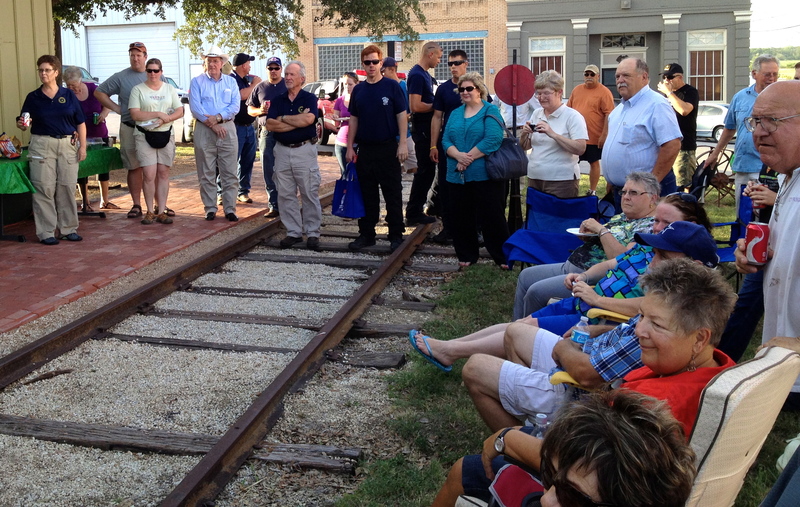 and tagged Coupland Depot Museum, Coupland Texas, National Night Out on August 8, 2014 by Stewart Dale Spencer. Meet Your Neighbors During National Night Out This Tuesday! Having fun at National Night Out in 2013. First, turn on your porch light! Second, pack your lawn chair! 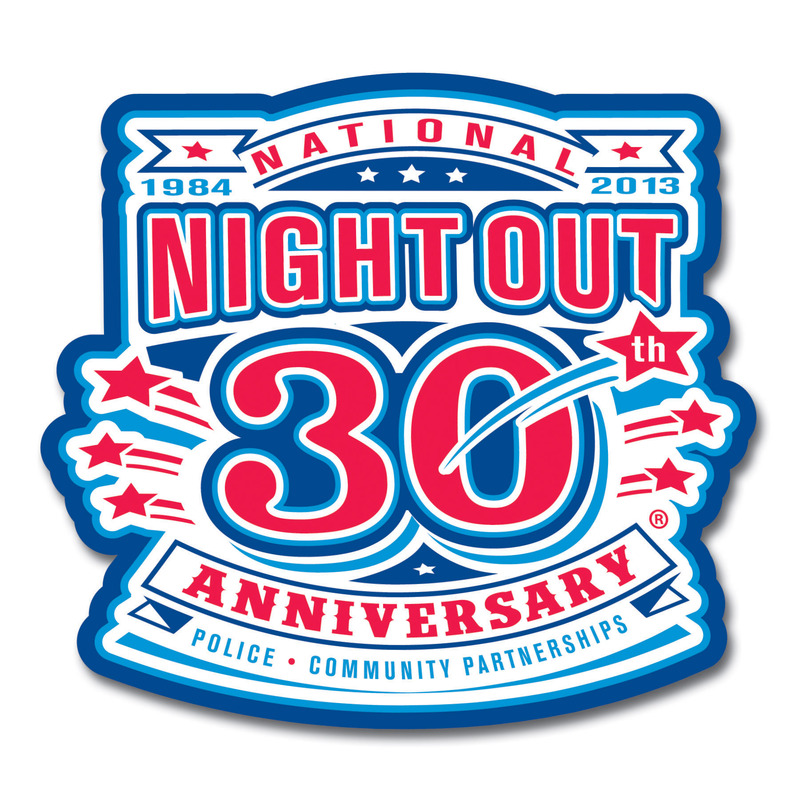 Third, join the Coupland Civic Organization (CCO) in recognizing the nationally celebrated National Night Out event! The festivities will be on Tuesday, August 5, at the Depot beginning at 6:30 p.m. CCO will be serving hot dogs (with all of the trimmings including homemade chili), chips, homemade cookies, sodas, and water. 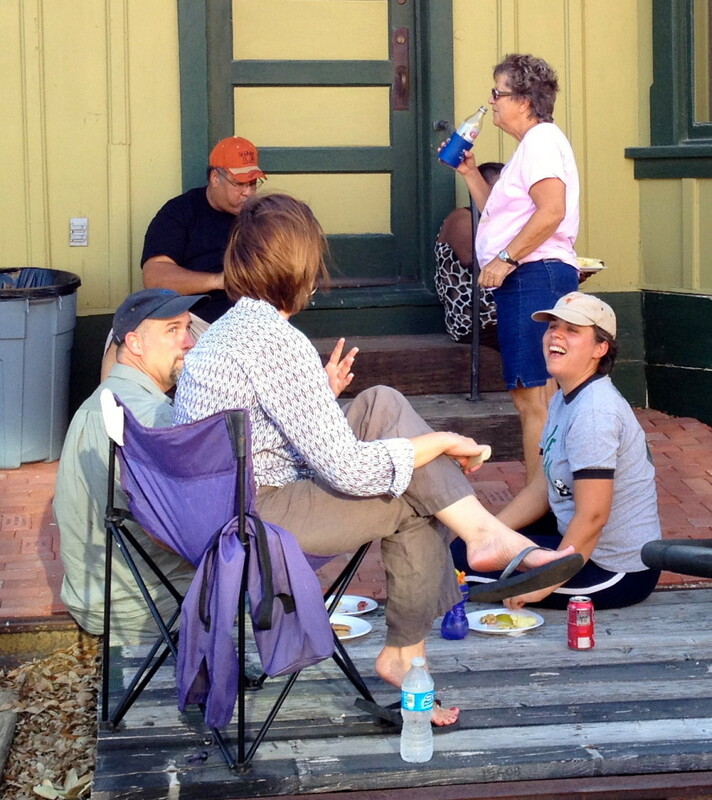 This is a great time to meet neighbors who have recently moved into our community. Of course we all enjoy chatting with those who have been here for quite some time. Worried about the heat? We set up on the east side of the Depot (shaded) and there is always a nice breeze to keep things cool. The Williamson County Sheriff’s Department always informs us of the most recent crimes occurring in our area. They also provide us with many crime prevention guidelines. All of the children (young and old) enjoy seeing the Coupland Volunteer Department fire fighting trucks, seeing their bright lights, and listening to the loud sirens. A neighborly group of folks at National Night Out 2013. This entry was posted in Social, What's New? and tagged Coupland Civic Organization, Coupland Texas, National Night Out on August 3, 2014 by Stewart Dale Spencer. National Night Out Was a Hit! 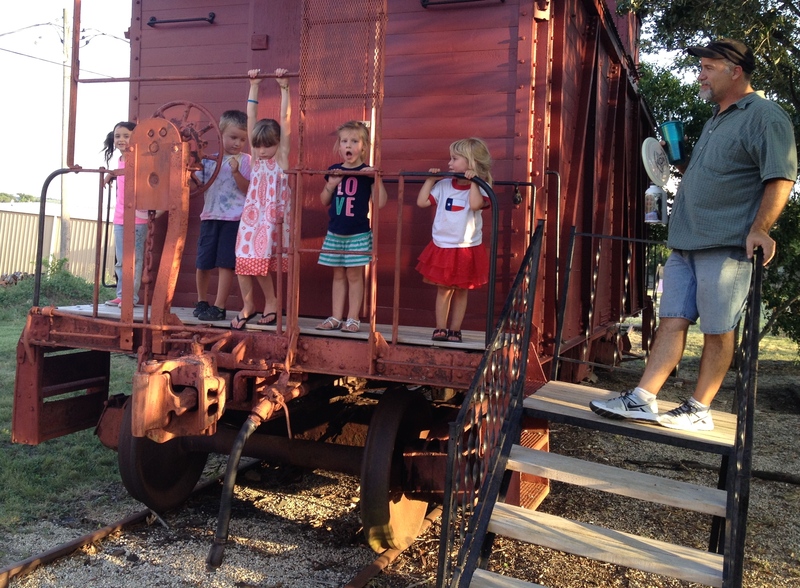 National Night Out took place on August 6 at the Coupland Depot and was very well attended, despite the early August heat. Shade and a good breeze goes a long way when temperatures hover around 100 degrees. With its recently repaired steps and platform, the caboose was a kid magnet! After a period of greeting old friends an making new ones, Barbara Piper, President of the Coupland Civic Organization, introduced a few folks who took a little time to share news and information and otherwise reach out to the good people of Coupland. Deputy Matt Kreidel, of the Williamson County Sheriff’s Office, spoke about security and preventing fraud. He reminded people to lock their homes and vehicles and to clear their mailboxes. He talked about email scams on Craigslist and suggested that instead of using debit cards in public (like at a restaurant) you should consider using prepaid credit cards. He mentioned the grandparent help scam, where people call grandma, pretending to be a grandchild in trouble, and get the hapless elder to wire money to them. These scammers often get personal information from Facebook and other social media and make excuses for why they don’t sound like themselves. Morrison chimed in on the security theme. He said he used to be a used car salesman and he knows how car sales are done. He said that if you are selling a car on Craigslist, make sure you meet the potential buyers in a public place. Pete Correa, Commissioner Morrison’s Executive Assistant, attended the event but did not speak. 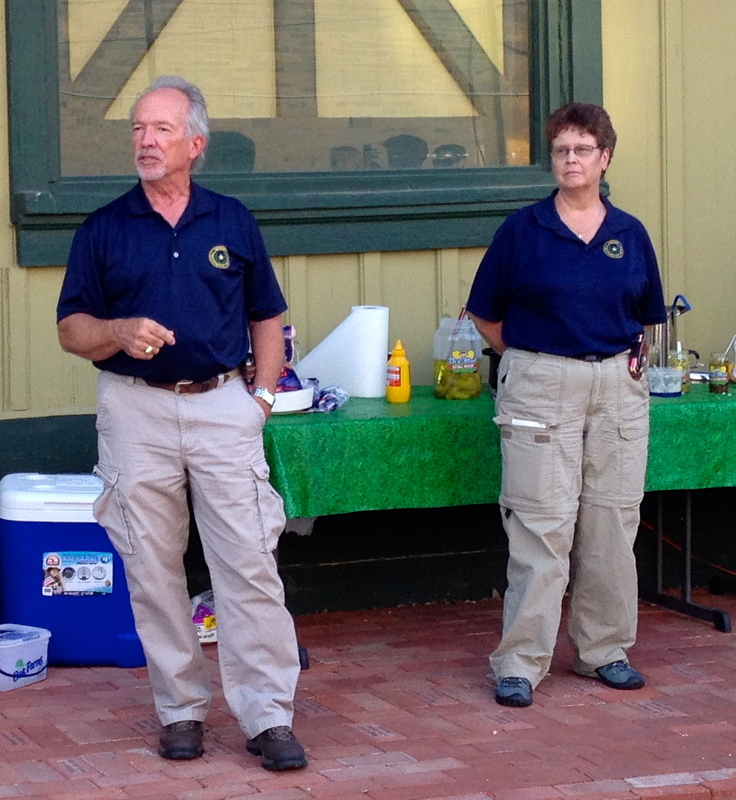 Coupland Fire Chief, Tracy Gardner, spoke about people burning trash and brush. He said that if someone complains about a fire, such as when smoke is blowing into people’s homes, the fire department must put it out. He said that they also have to put out controlled burns if they can’t find the land owner. The Coupland Fire Department rolled out a few fire trucks, to the delight of all the kids at the event. Jerry and Arlene Kaufman, volunteers from the Victim Assistance Unit of the Williamson County Sheriff’s Office, spoke about their work. Jerry described themselves as “first responders for emotional support.” He said they provide emotional support at a crime scene so law enforcement personnel can do their job. He reported that they have 40 volunteers on the team and that they may be called out by the Sheriff’s office, fire departments, or municipal police. Kaufman said they always need new volunteers and that volunteers usually work only one day per week. Click on their Williamson County Victim Assistance Unit website page for more information. Food for the event was provided by the Civic Organization. Becky Sutton made the delicious chili, which nicely complemented the grilled hot dogs. Several folks baked cookies. This entry was posted in Social, What's New? and tagged Coupland Civic Organization, National Night Out on August 26, 2013 by Stewart Dale Spencer. Participate in National Night Out, Coupland Style! 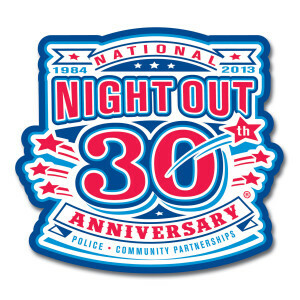 Coupland’s annual National Night Out Event will be held on Tuesday, August 6, at 6:30 p.m., at the Depot. The Coupland Civic Organization will host a supper of hot dogs with all of the trimmings, including chips, homemade cookies, sodas, and water. A representative from the Williamson County Sheriff’s Department will discuss crime prevention. The Coupland Volunteer Fire Department will exhibit their fire fighting vehicles. Come visit with neighbors, meet newcomers, and learn about helping to prevent crime in our community. This entry was posted in Social, What's New? and tagged Coupland Texas, National Night Out on August 5, 2013 by Stewart Dale Spencer.